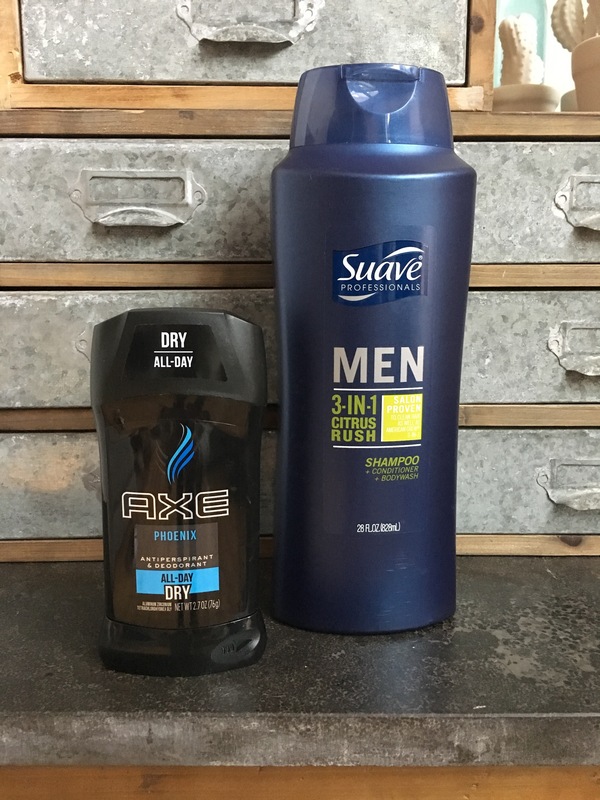 You know my boys are BIG fans of AXE products, so I’m always keeping an eye out for deals to keep them stocked up on their favorite products and scents. 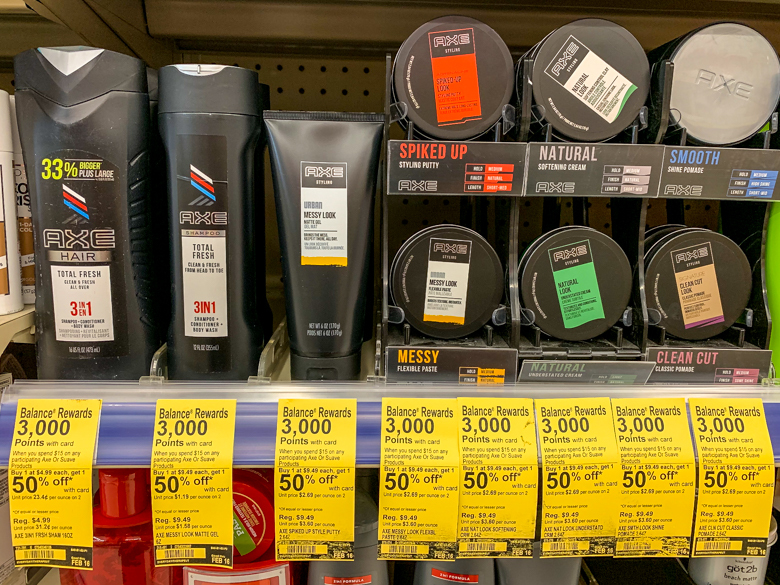 All AXE products are BOGO 50% off, which is a great way to save on the higher priced styling products. 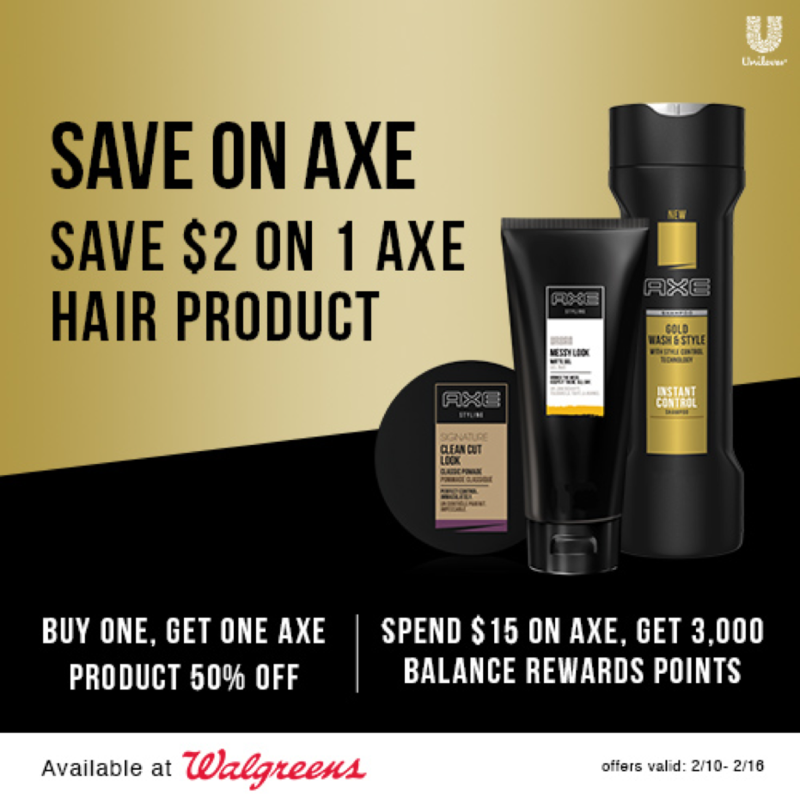 There’s a $2/1 AXE Hair Product Clip 2 Coupon available. You’ll receive 3,000 Balance Rewards when you spend $15 total. 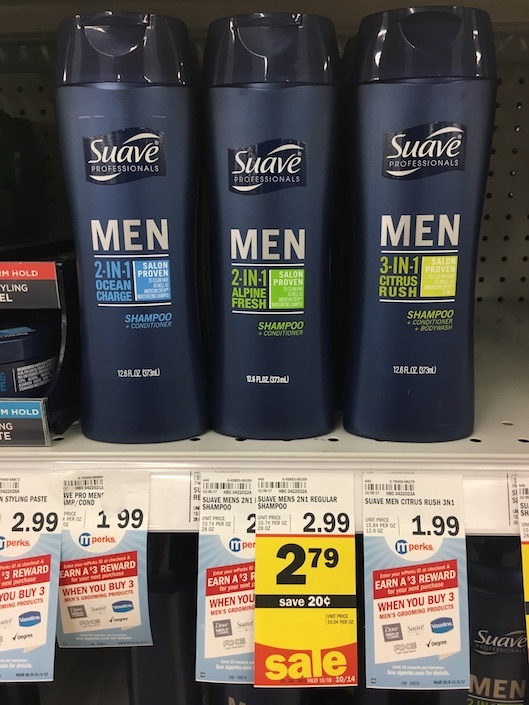 AXE Hair Total Fresh 3-in-1, $4.99 — while my oldest strongly prefers the AXE 2-in-1 Shampoo/Conditioner (and corresponding body wash), my two younger boys are just fine with this triple duty product. Added bonus: Walgreens had this 33% more bottle on the shelf, which stretches my dollar a little further! AXE Clean Cut Classic Pomade, $9.49 — my youngest isn’t too particular when it comes to scents, but he’s definitely opinionated on his hairstyle and the products he uses to achieve it. This pomade creates the structured style he likes, and helps it star put through school, soccer practice, and beyond. 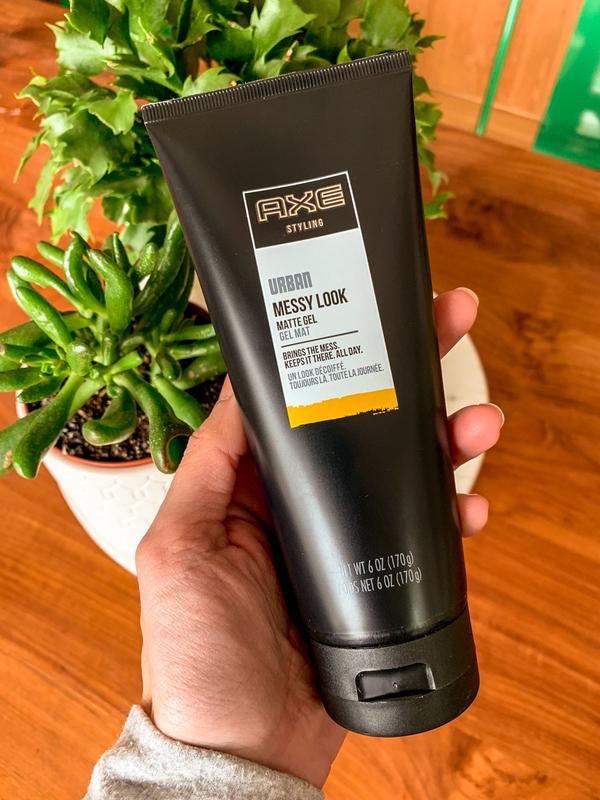 AXE Messy Look Matte Gel, $9.49 ($4.74 w/ BOGO 50% off offer) — my middle son has very thick, straight hair that gets greasy quickly. I picked up this gel for him to try. Hopefully it will help provide some texture and combat the shine a bit! After the $2 off coupon and BOGO 50% off sale, my total came to just $17.22 for all three items. 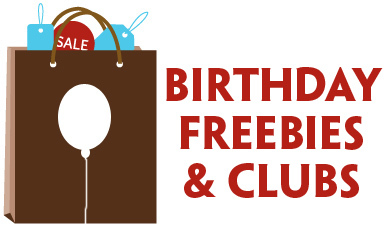 Plus, I earned the 3,000 Balance Rewards, which will save me $3 off a future purchase! 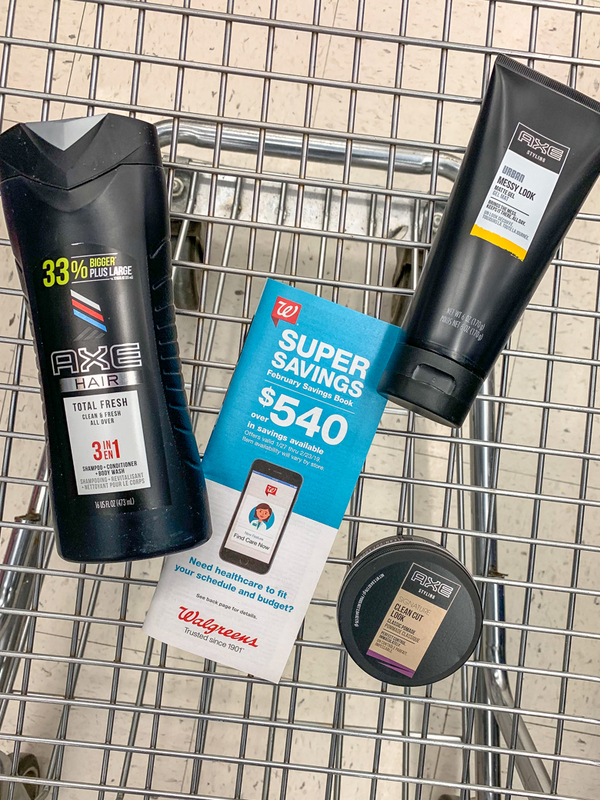 This triple dip on savings is only valid through 2/16/19, so head to Walgreens this week! School started a few weeks ago here, and I have to say it broke my heart a little that first morning when he hopped on the bus and threw me a peace sign from the window as it pulled away. Looking back, I really should have seen it coming. When we stopped at CVS to pick up some school supplies, he was far more interested in restocking his favorite AXE products than in choosing folders, notebooks, and such. 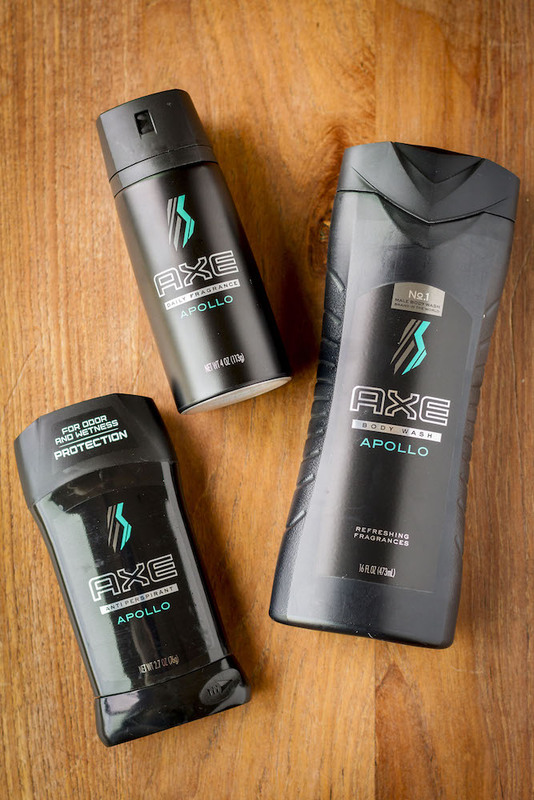 In case you can’t tell, he would totally recommend the Apollo scent, but AXE offers a wide variety, so you’re sure to find the perfect scent for your son! 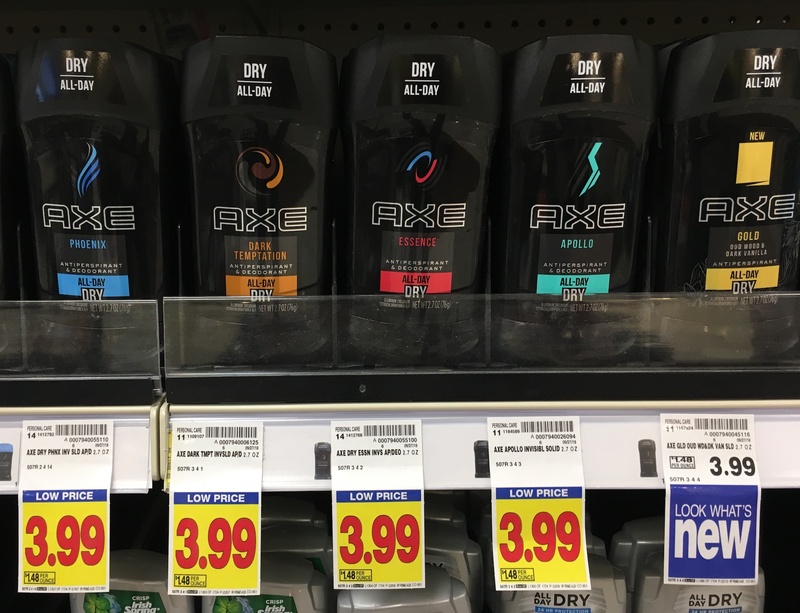 AXE Sport Blast Body Wash: Kick off or end your day with the exhilarating lather and clean, fresh scent of this 2-in-1 men’s body and hair wash. Its an invigorating boost to get you energized and smelling great all day – and night. AXE Apollo Body Wash: A classically masculine fragrance with an addictive edge. Crisp notes of green fruits and fresh sage make up this refreshing scent. Fill your palm and work into a foamy lather. Rinse thoroughly and finish with your favorite Axe fragrance. AXE Phoenix Body Wash: A classic, fruity fragrance featuring lavender, geranium and citrus. Its earthly composition and subtle blend of wood and fruit refresh your senses every time. Fill your palm and work into a foamy lather. Rinse thoroughly and finish with your favorite Axe fragrance. AXE Detailer Tool: The Axe Detailer is dual-sided to both exfoliate and gently clean. The scrub side of the Detailer removes dead skin and debris from rough spots like elbows and heels. Soft mesh on the flipside lathers to clean sensitive areas. Simply hang it to dry in the shower after getting clean. 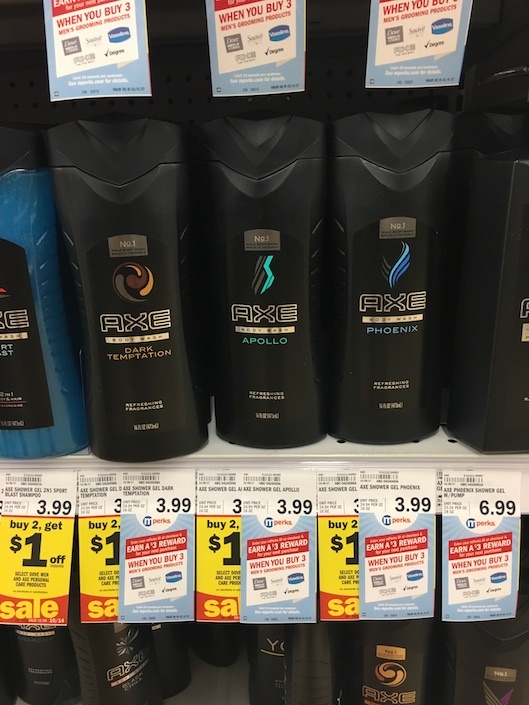 This week, AXE personal wash, shower detailers, and some of the antiperspirant sprays are on sale for Buy One Get One 50% off, so I headed back over to stock up for all of my boys. 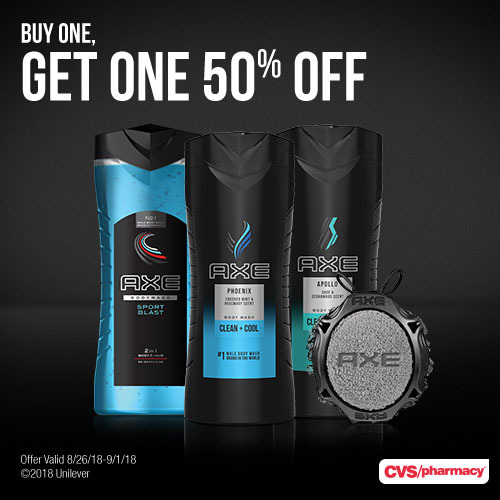 I mainly looking to stock up on personal wash and a couple of detailers, but I did notice that there’s a coupon that pairs with the AXE antiperspirant sprays that makes for a great deal! $4.99 ea. after coupons and sale! 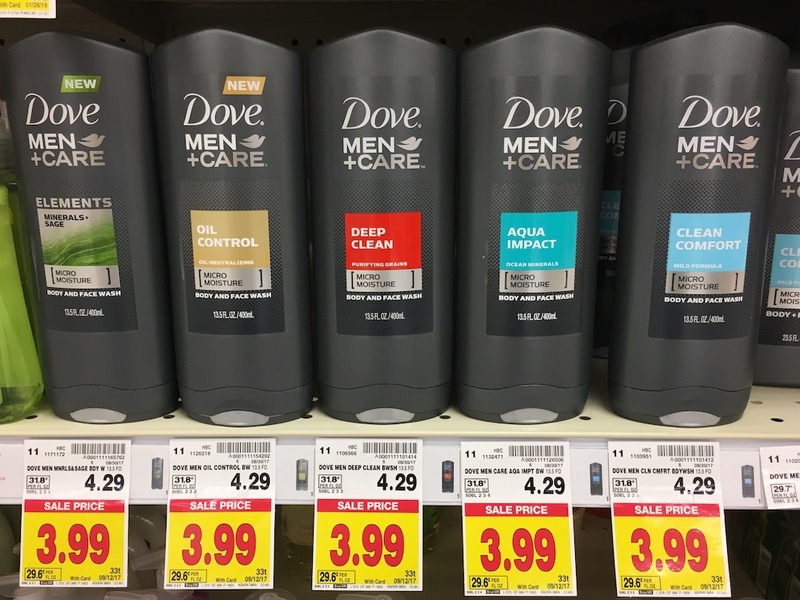 Sales like this make this mom of multiple boys super happy… But even if you’re only buying for one, this a great opportunity to stock up so he doesn’t run out at an inopportune time! 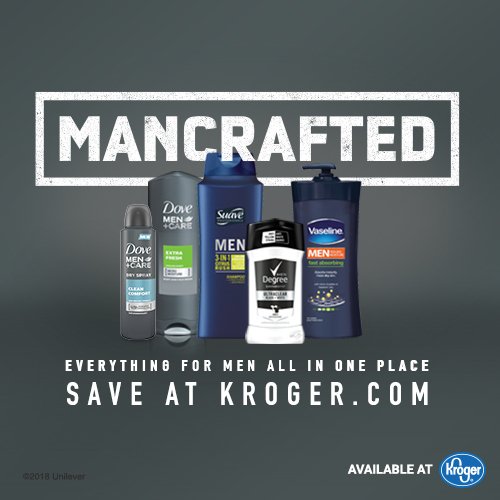 Get Mancrafted for Less at Kroger with AXE, Degree, Dove Men+Care, and Suave Coupons! 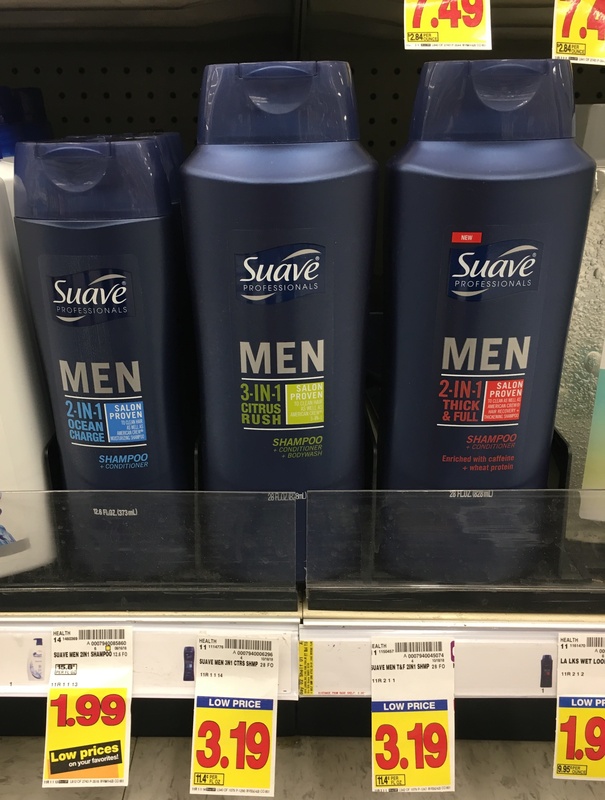 As a mom of 3 boys, I’ve discovered that it’s very likely that they’ll go through a phase sometime during their preteen years when they begin to think that personal hygiene is optional. No matter how vehemently they swear that they will never follow in the footsteps of of their older brothers, chances are they will. If you’re a boy-mom in the midst of this, I feel your pain. I’m still there with my youngest, who I’ll find still wearing the same sweaty soccer clothes he wore to practice hours earlier at bedtime. Who’ll even try to SLEEP (eeewww!!!) in those same grungy, smelly clothes unless I forcibly guide him to the bathroom for a shower. The good news is, at least in my experience, they’ll come to the realization sooner or later that personal hygiene is a must. Whether it’s girls or peers or that one day they find they can’t stand their own body odor after sports practice, it WILL happen eventually. My tip for you to help this along? 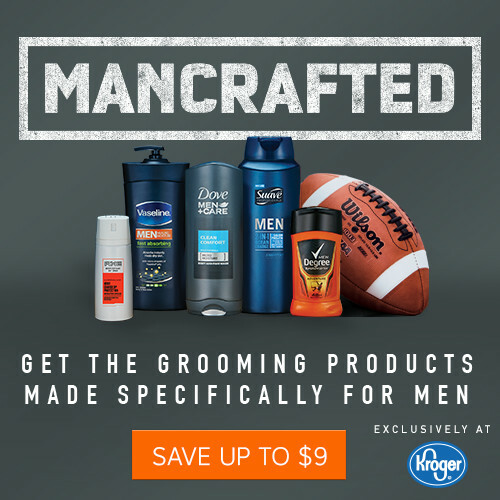 Help them find a trio of “manly” scented personal care products that they like, and gently encourage them (repeatedly) to make good use of them. For my oldest son, this is anything in the Apollo scent from AXE. 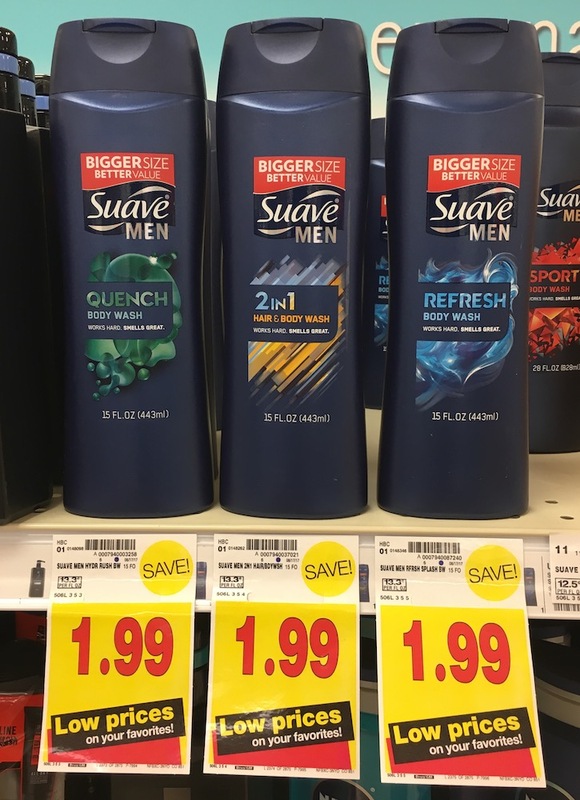 So I’m always keeping my eyes peeled for sales and coupons for AXE products, and it’s especially nice when I can find savings on them at Kroger. 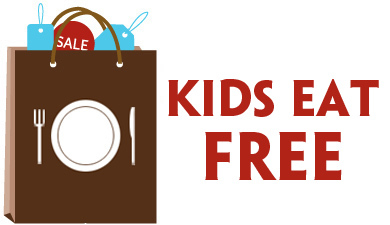 That way I can just pick them up with my regular grocery shopping instead of making multiple trips. Because, honestly, who has time for that anymore? 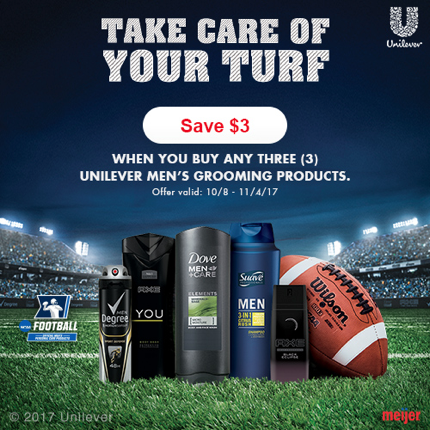 Right now at Kroger you can save up to $9 with exclusive digital coupons that will help you save on your best guy’s favorite personal care products, including Degree, AXE, Dove Men + Care, Suave… Clip them to your Kroger card now to save instantly at checkout! P.S. 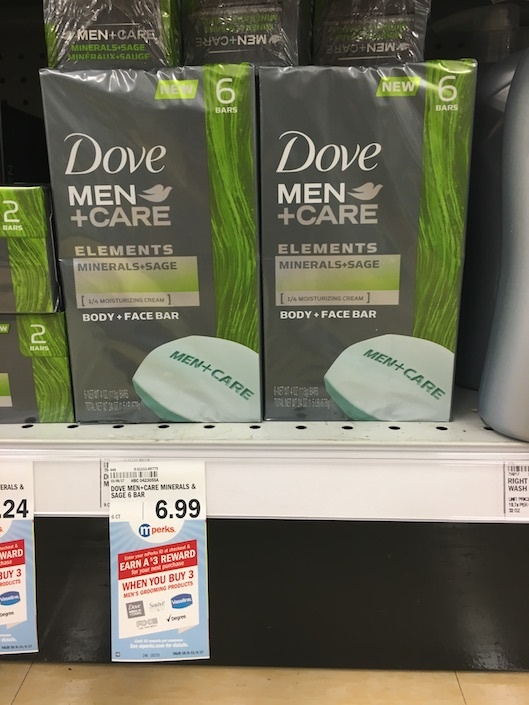 these men’s personal care coupons all expire 10/31/17, so be sure to use them before then! $1.99 after coupon and Ibotta deposit! 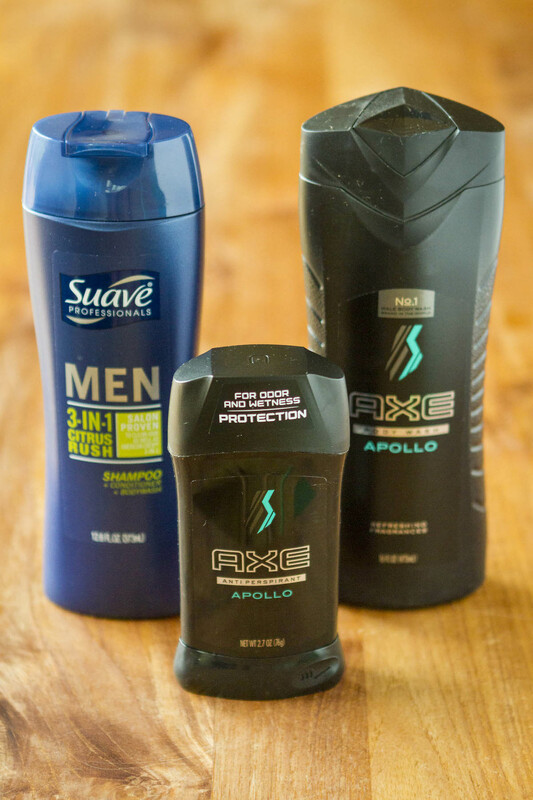 Of course, I used the savings to pick up some of the AXE Apollo products. 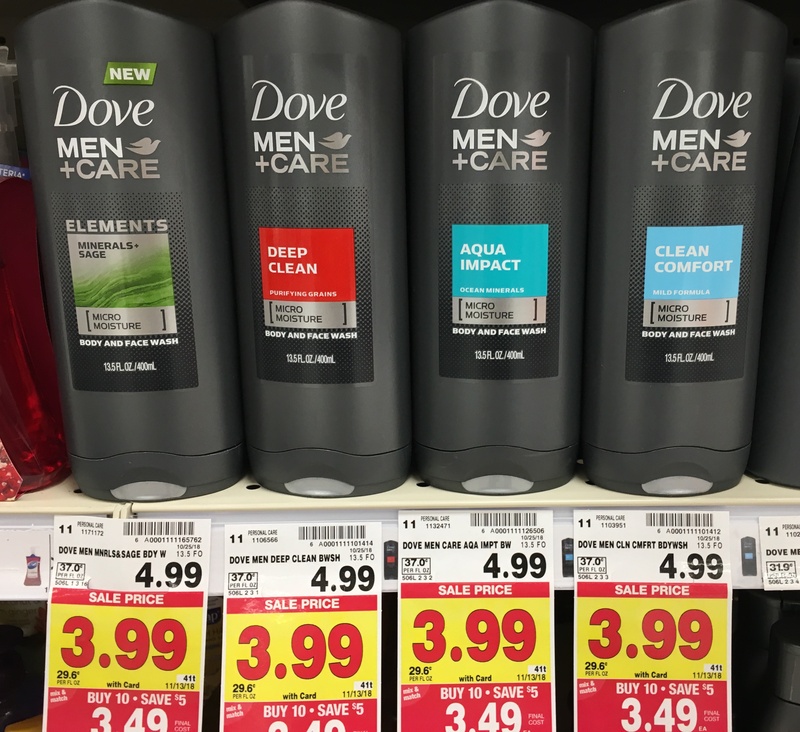 I saved $1 each on the antiperspirant and body wash using my Kroger card! 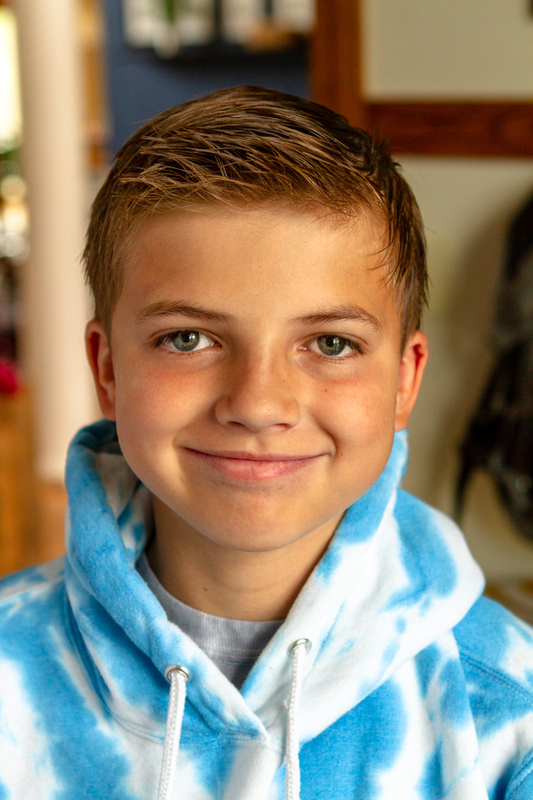 Do you have any other tips for getting older boys to focus on personal hygiene?